The M3 Android Communicator is an Android-based phone designed for Asian markets. 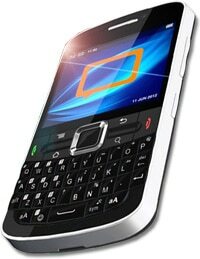 Announced in February 2012, the device will have both a capacitive touch screen and a keypad. Maker DMD Mobile is looking to serve users who cannot afford the cost of a brand name smartphone by pricing the Communicator at around RM500 (US$165) in the Malaysian market. As an added benefit, RM10 per month will give users unlimited chat and unified SMS and email. The devices feature Bluetooth 4.0, assisted GPS and Wifi as well as NFC with support for both SIM and MicroSD-based secure elements. DMB focusses on developing low cost Android mobile devices with a low bandwidth service platform to provide users with unified communication at a much lower cost than existing devices and data plans. Boss Herve Jegou was previously the CEO of another Malaysian NFC phone maker, Fonelabs.